Porto Santo Island is the second largest island of the Madeira archipelago and is located 75km northeast of Funchal. By air the trip takes no more than 15 minutes, but by boat it takes two hours and a half. Reside here permanently about 5,000 people, although at the time of the holidays the population increase considerably with the arrival of holidaymakers from Madeira, the mainland and other parts of the world. The area of the island does not exceed 41 km2, the maximum length is 11km and has a width of 6 km. Compared to the green Madeira, the landscape of Porto Santo is dry. The extensive beach with 9 km of golden sand, has no equal. It is said that here the time seems to run slower and all the concerns disappear. As in Madeira, the warm Gulf Stream softens the climate and temperature of the sea water is pleasant. And even when it rains in the summer, the beach is still inviting. Although it is an island with volcanic origin, there is no latent volcanism, even in its milder manifestations, such as the hot springs or fumaroles. Geologically older than the Madeira Island with 13.5 million years, this island is flatter, except the peaks rising in the eastern and western extremes. The highest points are the Pico do Facho (517 m altitude), in the extreme east and Pico Castelo (438 m altitude) which dominates the north Vila Baleira, the main town. Offshore there are several islets, the higher is the Ilhéu de Baixo or Cal (for southwest, toward the Madeira) and the Ilhéu de Cima (which seems to extend sea within the rocky ridge that rises north of the marina). 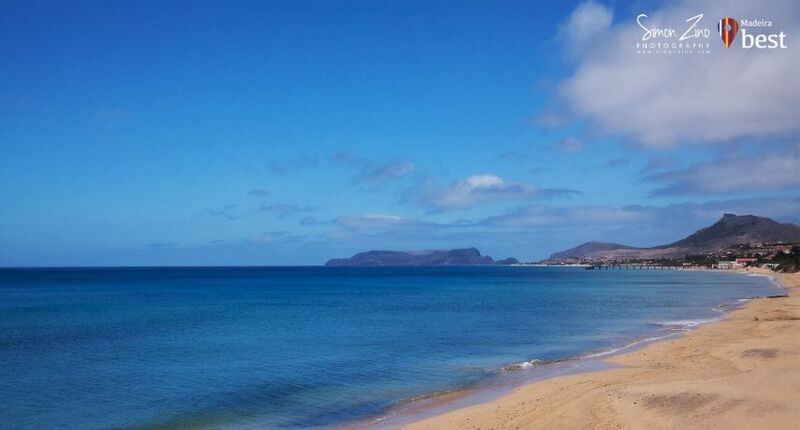 The sea and the beach makes Porto Santo single. The sea is heavenly, warm turquoise waters and waves gently breaking the sand. The beach, considered the best dunes beach of the country is perfect, there are no strong currents or treacherous dips in the sea. As you walk to the west, the sand begins to be separated from the coastal road by small chains of dunes. In the opposite direction the beach gets narrow after being crossed by the old pier. The sand is known for its therapeutic qualities and it is not uncommon to see people completely buried, sometimes only with their head out. One of the reasons for leaving the beach is a trip to the grapes. They are sold along the coastal road in stalls, and are light green with a sweet and watery taste, with an immediate cooling effect. The strains have adapted to sandy soil and sometimes occupy the space beyond the dunes. From the local grapes is produced a wine that looks like the ones produced in Madeira. Here survive rare varieties of grapes like the friar of skullcap and molar ink, extinct in Madeira. Particularly well adapted to local conditions seem to be chaste as listrao, ink and Terrantez. On November 1st we celebrate the Wine Festival, sovereign opportunity to taste the new wine. In recent years, the island has been the target of a tourist investment plan. There is a golf course with 45 holes, a tennis club, a riding center renovated, playing areas on the beach and many other tourist entertainment activities. The nightlife in Porto Santo also has a new life with the emergence of a number of new bars and parties organized during the summer.